Limavady United striker Robbie Hume. Limavady United boss Paul Owens wants to finish the season strongly. United entertain Knockbreda this Saturday (3pm) and Owens believes his players are ready to go. “After the Dergview result and performance, not having a game last weekend wasn’t what we wanted, but because of it everybody is chomping at the bit,” he said. “We basically have seven cup finals and that’s what we’ll be saying at training this week. “The last couple of years we have been challenging for a title and the focus was massive throughout the squad and we need to make sure that we replica that this year. 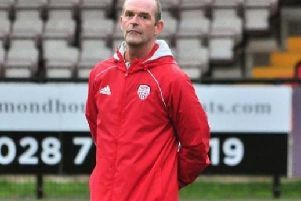 Owens also believes that his players will be out for to ensure they are playing Championship football next season. “I want to be a Championship manager next season and we, as a squad, have worked tirelessly to get promoted,” he added. “There are four or five in our changing room who played Championship football with Limavady when they got relegated, so there are a few players in our dressing room with a lot to prove. The player/manager, like most weeks, again has a number of players struggling. “We’ll have a few players missing but we’ll know better later in the week,” he explained. “I’m hoping that Robbie Hume and Johnny Watt both make it, but they are struggling at the minute. “They would have both missed last Saturday had the game gone ahead, but fingers crossed they can make it for Saturday.